I’ve been on a number of set visits over the years and very, very rarely do members of the press get starstruck. And it’s even more rare to see members of the cast and crew equally starstruck as the press. 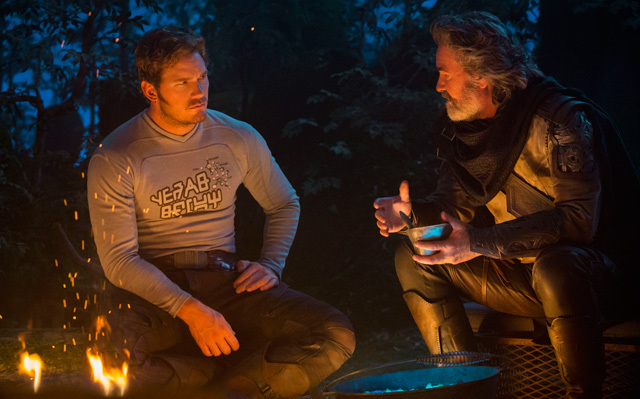 But that was the case with Kurt Russell on the set of Guardians of the Galaxy Vol. 2. As the star of such cult classics like Big Trouble in Little China, The Thing, Tombstone, Escape from New York, and more, everyone grew up loving his films. In fact they even have an influence on the character of Peter Quill and the Guardians. Chris Pratt, Dave Bautista, James Gunn, and others universally praised the actor personally and professionally. As we got to meet him, we saw why. When we visited the set in Atlanta last year, we were told that Russell played Peter Quill’s father… and not much more. As we looked around, we saw the name “J’Sonn” was all over concept art and a chair on set, but Marvel has since revealed that Russell’s character is Ego the Living Planet as well as Peter’s Dad. How that will play out remains to be seen, but one thing was quite clear – Kurt Russell was having fun in the role. Encouraged to improvise and simply follow his instincts with the character, Russell seemed to be enjoying the experience immensely. 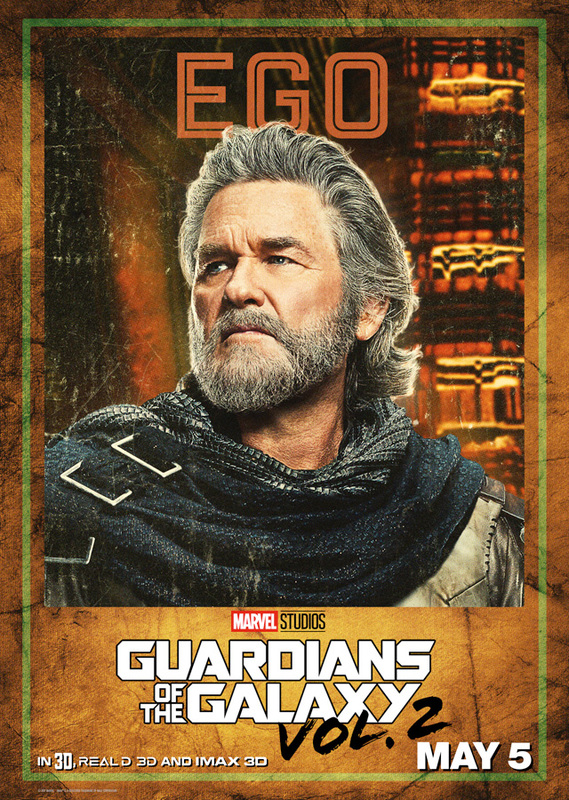 Check out our Kurt Russell interview below, and be sure to grab your advance tickets for Marvel‘s Guardians of the Galaxy Vol. 2 now, as they just went on sale! Q: What’s it like joining the Marvel Cinematic Universe? Kurt Russell: Well, you know, generally, when you’re in this business for a long time, you get the opportunity to do a number of things. And then, they sort of always, at the end of the day, acting is acting and stories are storytelling. And you’re going to work with people that you hope are really kind of creative and fun, and directors that are on top of their game and know what they want to do. And then, sometimes that happens and sometimes it doesn’t. So the great fun is, for me, I didn’t know anything about this world, the Guardians world, you know? I was doing publicity for “Hateful Eight.” And suddenly, people started saying, “Is it true? Are you going to play Peter Quill’s father?” And I’m like, “I don’t know what you’re talking about.” I just wasn’t aware of it. And then, all of a sudden, for the first time, this was a character obviously that people really wanted to, they were interested, they were all very positive, though. It was nothing like, “Seriously? You’re not going to do that, are you?” It was like, “Whoa, are you going to do that? That’s perfect. You should do that.” And I didn’t know what they were talking about. So when I had the opportunity to see “Guardians of the Galaxy,” I got it. I understood what it was, and I could see the reasons why people were interested in that. And the fun part has been tapping into all of that, bringing the right baggage, and having the opportunity, still, to explore with James Gunn and Chris and the whole gang. And then, the fun is that you find that Chris is just a sweet guy and is just a great, great sweet guy, and James is just a load of fun and really, really knows what he wants to do. And then you’re back to the opportunity to play a character that you hopefully can find things to make it fun and entertaining and interesting and memorable. Q: So what can you tell us about your character? Russell: Not much. (Laughs) Unfortunately, not much. We were just talking about it. It’s a little hard to bite your tongue and do that, but there’s a lot about the character that we want to keep under wraps I guess, and for a certain period of time. But the good part is, he’s no let down. (Laughs) He has a great, adventurous spirit that he shares with his son. And you know, the idea of being able to find someone that you’ve wanted to see for a long time, and I think the whole thing basically being seen through Peter Quill’s eyes, we can all understand how you’d want to meet your dad, if you didn’t know who your dad was, and you’d heard these things about your father and you’d been told certain things by your mother, and you’re trying to put together a picture. We all have a tendency to, I think when it comes to parents that are missing, we have a tendency to put them on a pedestal. And Peter is living in that world. But to finally have the opportunity to meet that person, and then begin to compare who they had in mind and what they’re really getting is a lot of what we’re doing. Q: What’s your relationship and rapport with Chris, as you develop that father/son relationship? Russell: He says funny things. He says funny things. We were rehearsing one time and he said, “No, I want you as my dad. I want you to be my father.” You know, it’s fun. They’re all very welcoming and very sweet. And the cool thing about it was, when I did read it and saw the movie, I said, “Yeah, I bring the right notes, the right garbage, the right baggage, all of it. I bring the right things.” And as I read it, look, I connected the dots from some of the things I’ve done in the past. And it’s fun to be living now in a time when a younger generation understands what I was doing. You guys get it. The older guys, my age, they didn’t know what the f**k I was doing. They really didn’t. And it was like, you can go back and read about it. It was like, “What is that?” I think it’s funny. Whatever. I just did it for a lifetime, so to be at this point in my life and be able to not only kind of like have a generation that accepts you for what you were doing before anybody else was with other people like you, to be able to take that and grow that, it’s nice, because it has a lot to do with my personality and the way I look at life and stuff. And so, it’s a nicer time for me than it was 30 years ago. Q: You talk about connecting the dots from some of the earlier characters you’ve played. Russell: They’re performances. The characters could’ve been played many different ways. Russell: The fact that I played them the way I played them, that’s what I’m talking about. You could’ve played Jack Burton a thousand ways, but I chose to play him that way. That was what I saw. Q: Is that informing what you’re doing here, in some sense? Russell: It informed why they wanted me to be here. Yeah, that’s very fair to say. And we do things, we get to work all day long, and instead of the director going, (Laughs) “Okay, now let’s…” I actually think that’s the way to do it. I think that’s actually funny, and also kind of pathetic and kind of real and blah, blah, blah. Well, yeah, Quentin Tarantino, John Carpenter, Ron Howard, Bob Zemeckis. Those are those great guys, and Mike Nichols, they always made me feel verified in the way I was going about things, you know? But, and other things, when especially critics at the time would look at the movie or not understand why something’s cool or, “That’s funny! Don’t you get that?” So you know, sometimes it was hard to keep my own course and be criticized for it. And some of those people that work with you, to watch them kind of—I’m talking about agents and things like that, watch them and kind of go, “You know, we could go down this other road, where you play this same character four or five times and the studio knows how to sell you.” Yeah, I got that. I don’t want to do that. I can’t breathe, if I do that. So now? It’s fun. I’m just in a period of time where I’m getting to play characters that are really fun. And yeah, it’s a bit of an opportunity to take advantage of the way I created some guys in the past that you guys, the people your age are more in tune with. You understood it. I mean, I sat there and listened to studio heads after watching a performance and go, “I don’t get it. He’s not that good at what he does. Kurt is not really that good at what he does.” And I’d look at John (Carpenter) and like, “Well, you’ve got it.” But you know, I have no animosity. It’s not bad. It’s just like, I guess sometimes it takes a while for it to be seen or something. I don’t know. It feels good, though. It feels nice to be here. Q: What do you think is the most fun about playing this character? Russell: He’s 360 degrees of a human being. He’s 360 degrees of a human being. We all are capable of many different emotions and behaviors and thoughts and abilities and the way we sometimes respond to something is just very, it could be very, very different. You can one day feel this way, and the next day, feel that way. The fun part is that you have a director who really knows what he wants in terms of the storytelling and he’s obviously not afraid to play around. He’s encouraging that and he’s encouraged these people to do that. I mean, look at the broad characters they play. And then, along comes this character, who they’re all going to be dealing with, especially Peter. And he invites that into the room, too. And so, when you’re the actor who’s being invited to play in that sand box, yeah, I’m your guy. Let’s go have fun. Let’s go put a lot of different possibilities in there for you to play with when you get in the editing room. Q: Is there a character that you don’t cross paths with in the movie, that you wish you got to work with? Russell: Well, I get to work with everybody. There are some that it would be fun to be able to work more with. But I was talking with Chris the other day, and I was saying, “You know, the really fun part about this is that you and I really get to work together on this movie.” You know, a lot of times you’ll be looking forward to the opportunity to work with somebody, an actor, an actress. And sure enough, you get that opportunity and you’re not in the same scenes, and you’re kind of like, the audience I think sometimes thinks, “Oh, this is going to be an opportunity for these two people. Yeah, I want to see them.” And you never really see them together. That could be disappointing. That’s not the case here, and the case especially with Chris. We really work a lot together and we did many different scenes together. And that gives you the opportunity to play them many different ways. And because they both know their universe so well, it was fun for me to be able to sort of come in and go, “Okay, well, here’s where I’m going on this one,” and then be able to just turn it around on another take. And never could they go, never would they go, “Whoa, whoa, whoa, how does that work?” That didn’t happen because I understood it and I understood what James was—what he’s going for. He’s a really good writer and really astute audience and director. And he doesn’t shy away from all different kinds of true emotions, you know, heavy loading it in terms of real emotions, then coming off of that. And in different scenes, we do a lot of that. And so, hopefully it’ll be as entertaining as it is fun to do. Q: When we meet your character, where is he in his life? Is he fighting? Russell: I’m looking for Peter. Q: So you’re on a quest to find him when we meet him? Q: Is Peter his only kid? Russell: I can’t answer that. You know, there may be some Marvel answer to that, that I don’t—you’ve got to understand, you’re talking to someone who’s not—I’m not, I never was. I just like movies and stories and stuff, so I don’t happen to be an aficionado. Q: Does the movie explore a little bit about what brought this character to Earth in the first place, the father, or what he’s been doing the last couple of decades? Q: When you enter the film, you’re with Pom, with Mantis. Could you talk about the relationship between your character and Mantis, and can you? Russell: Yeah, what she is to me? That’s not good, actually. No. It’s so hard. It really is. It’s really weird, and it’s great fun to talk about. That’s what’s tough about it. I don’t think I should. I don’t think I should. I mean, she’s an important player, and her relationship to me and to the movie is an important one, so they’re all important. He knows the rocks he’s lifting, and put that back underneath there and we’ll get to that in the third act. He’s got a very full painter’s palette. It’s very intricate. It’s pretty intricate. You’re going to kind of go, “Wait a minute. That means if that person’s that and that person’s over there, that means too late.” It’s like, whoops. S**t. So he makes you watch and think and points to the future a little bit and says, “There’s a lot to this story and to these relationships.” And unfortunately, I can’t answer your question, really. Q: Did James tell you Jack Burton was an inspiration for Peter Quill? Russell: Well, the thing is, when I saw the first movie, I watched it and I sat down with Goldie and I said, “Hey honey, I’ve got to watch this movie to see what this is they’re talking about.” And I told her, I said, “You know, a lot of people are calling me saying, ‘Are you going to play this guy?’ They’re all excited about it.” And she said, “Yeah, what’s that about?” And I said, “I haven’t any idea. I don’t know.” And so, she said, “Well, did you read the script yet?” I said, “I don’t really want to read it until I see this movie. And so, I want to see this first.” And I don’t remember if I actually got to do it that way. I think maybe I ended up reading the script first and then saw the movie. But so, I sat down with Goldie, and yeah, I did read it first. And I thought, “Well, if I read this correctly, just the music choices alone tell me something, that he writes.” And so, we sat down, and within about three minutes of watching Chris, as soon as he kicked one of those lemmings, I went, (Laughs) “Okay. That’s cool. That’s my kinda guy. I know where that kind of goof comes from.” And then I watched a lot of it, and I was like, “Okay, well, that’s three or four references to different things.” And I went, “Yeah, okay, I’m getting this correctly. I’m reading between the lines right.” And I thought, “Yeah, this is really fun.” When you read this script, there’s a lot, as an actor, to not understand what it’s going to look like. So it’s also a lot of fun to come here and get in the room with James, and then you walk in the room and you’ve got stuff on the wall and you go, “Ah okay. There we go, there, there, there, there. Oh, that’s what that is. Okay, I wondered about that. Oh there we go. There’s the spaceship, there’s the thing, there’s the planet. Okay.” And that’s where the—okay, I’ve got it. And once I could do that, then I really started being able to look at what I was thinking, because you’ve got to get all that out of the way. You’ve got to get all that stuff out of the way so that you can just, on the day, just go into the room and literally throw everything away and just talk to the person you’re in the scene with, as you should, as the person you are. You’re no longer playing a character. You’re now that person. Audiences are never going to see, the character I’m playing, they’re never going to see another version of it. They’re never going to see the takes that he chose not to use, let alone the actors he chose not to use. So the audience just sees what they see. You know, they see that. And that’s why it’s important, I think, to give him as many opportunities as he can to pick from things that’ll work for him. You have to have a lot of trust to do that, because you get burned a lot as an actor. You give somebody, you give some guy real free reign and he just doesn’t know how to edit it properly. It just comes out messed up. Q: We saw the concept art you were talking about for J’son’s ship. Q: Yeah. Was there a physical set for that? Is that fun for you? Russell: There’s some of it, yeah, there’s some of it. It’s definitely more fun when you’re able to be there than in a room filled with a blue or a green screen, with orange dots on it. You know what it is, and throughout the years, like when we did “The Thing,” back when we did “The Thing,” we had a lot of puppets on that. So there was a lot of live action stuff that you could rely on and you could see. But a lot of it was gobos with X’s, you know? I used to say to John, “So this is when he’s like, really looking bad?” “Yeah, he’s really looking bad. Give me that again. Ah, he’s got big teeth and he’s got” – “He’s, okay, he’s really bad, okay. And where is he?” “He’s about there. That’s about his mouth. There’s about his mouth and his eyes are up there.” “Okay.” So you’re dealing with a lot of unknowns in that regard, but when you see some of the drawings here, it’s very helpful. And you know where you are. You know where you are in the room. Q: Is this your first space opera, spaceships, laser guns, all that? Russell: You know, it’s funny, I’ve gotten to the point now where my character at one point, it all kind of goes together. I guess. I don’t remember doing one. Well, wait a minute. Hold on. Whoa, no. No. One time, I was in a movie that was really kind of reinventing all the sci-fi stuff, “Stargate.” That was a long, long space, when there was no sci-fi out there as a movie, and “Stargate” was a real surprise to the audience. It was really something that was real science fiction-y. Q: Is your character a fighter? Do you have weapons? Russell: He’s a fighter, yeah. Q: Do you use your fists a lot or have a physical role? Russell: He’s probably used just about every weapon you could conceive. Yeah, he’s an adventurous sort, yeah. Q: We get this great sketch of who his father is in the first movie, do you think that’s an accurate representation of who he is, based on what we know? Russell: I do, yeah. Yeah.